Someone left a post the other day asking me about Tente. If you don’t know what it is, you’re missing out. 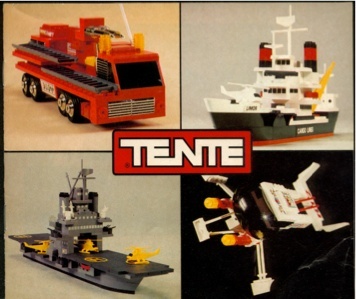 Tente was a Lego-like building system that was mainly available outside the US. I got mine while living in Colombia, SA. Too bad. I just tossed a few hundred 30 year-old Tente bricks in the trash yesterday. Most of them haven’t held up as long as my 30 year-old Legos, although they were much more detailed than their Lego contemporaries at the time. I still remember as a boy living in Chile, when my parents gave me the TENTE Estación Polar “Artic 2” for christmas, I played with that for years and took very good care of it. TENTE was a great way for me to play using my imagination. I WILL BUY ALL THE TENTE PIECES YOU HAVE JUST CONTACT ME AND PUT THE PRICE THANK YOU………………………..
WOW … I had some Tente, Loved them … but obviously Lego won. I would be interested in buying Tente that people have laying around particularly if they involve Tente ship models, particularly military. You can contact me at eric_in_it@yahoo.com. Sorry for the extra post. Ilive in the UK and have bought my son over the years Tente model ships when we have visited spain on holiday. Recently we have found it is no longer stocked in shops and despite communication with Borras the curent owners we are unable to find out if the product is no longer produced. Do you know if it is still availbale? Hi, Helen unfortunately borras is not producing anymore tente models and the only way to find some tente is on e-bay at very highly prices. Have a nice day……..
Wow, it’s weird seeing Tente again. I have to admit though… as a kid, I HATED them. Even that young, I still kinda’ knew they were a Lego ripoff. The quarter-dome pieces were neat, but some of those parts were terrible. The plastic was so inferior that breakage was a COMMON problem. Worse yet, here I am some small kid with like a TV antenna part, one the brittle branches coming off it break, next thing I know I’ve got a cut on my hand. I recognized them for having some interesting detail that Lego (at the time) didn’t have… but all the sharp edges, sharp pegs broken off in the stud holes, and all the white fracture marks littering the bricks really ruined my fun. AWESOME battleship by the way! I’d forgotten about those unusual dome pieces until I saw your pics. Ever think of updating or recreating it using modern Lego? I discovered Tente in Portugal in 1985 while living there. I have developed an involved play where I designed and mapped out an island for the ships; I’ve created my own new parts, including roofs for buildings, small steps, small truck bases and truck trailers, trees, etc. It is sad that they are no longer manufactured. Tente is a GREAT toy. It requires more imagination that Lego, but never had the international popularity. This set was one of my own from about 30 years ago, and though it is missing a few pieces, it has held up well over the years. It might be a good value for someone who likes to collect this type of thing, or someone looking for a unique toy for a child. Gosh I haven’t seen them in the past 20? years!! They were the definition of my childhood 🙂 TENTE ROCKS!! When I was little, Tente was superior than Lego. It has more interesting sets (space vehicles/bases and ships then the Scorpio line). Spent countless hours playing with it in my childhood. Nice to see some rabid and kindred fans exist. A small group, well-aware of Tente’s superior qualities. My interests were in the commercial ships, less the military, but these days any kit would be great. About four years ago some came available where I live that included the Titanic and, of all things, the Cutty Sark. I was more interested in the ones I saw that were Commercial fishing village, some business storage depot, and sets like that which included ships and shore facilities. All for fun. (PS – Tente’s ship scale is roughly similar to model railroad Z-scale. I just came across this site after I posted a small Tente ship set on eBay. http://cgi.ebay.com/ws/eBayISAPI.dll?ViewItem&item=320470399342&ssPageName=STRK:MESELX:IT Anyway, if you are interested, check it out. I have about 20 Tente military ships of various sizes ranging from three aircraft carriers, battle cruisers and missile cruisers. Many of the configurations are designed after modern warships. Designs are superb. If anyone wishes to purchase them, I would be willing to part with them. Weren’t there little free sets included in Cereal like Frosted Flakes back in the early 1980s? I have a bin of Tente probably twenty pounds of them. I found all mine at afreight-damaged store. I have some of everything. Hi, anyone has any Tente for sale here??? Hi, I,m Jose From Spain. Collector of TENTE. I have a Tente Dragon helecopter ship that I found. Where can i find instructions so my son can reassemble it? Wow. Cool find! No idea where you’d find instructions. But if you do, lmk. Would be happy to post a copy on the site for archival purposes. It’s entirely in Spanish, but if you view it with Google Translate it’s quite easy to navigate. I have almost the entire Scorpion set of military vehicles, my favorite childhood toy. I may put it on ebay if its complete after reading some of these posts! Tente was superior to lego in many ways. They sort of combined regular and technical lego in one. I had some of the space sets and my bro got the mar sets when we were kids. I liked the fact that unlike lego, Tente peices could be put together in more than one way, they could even be assembled with peices back to back. Any one remember the sort of transformer line they did, o remember having one of those, the Hermes I think it was called, way ahead of lego. Unfortunately, as mentioned else where, the peices where a little more fragile than lego, but I think that was also because they seemed to lock together better, so more force (teeth) was often required to separate the peices. Although I remember it being a real kill joy if one of the studs snapped off in one of the holes……oh and that those tanker style domes that had studs/holes on both the top and bottom, wouldnt secure well when 2 fit together to make a ‘flattened ball’ %if you know what I mean) because they flexed too much. Ahh……sweet memories. In fact, I found some of my old stuff at my parents the other day and my kids are happily playing with it now, though not enough of the right peices to male up the stuff on the box….. I have a about a gallon Zip Loc of Tente pieces, including Formula 1 Power Pack, plus assembly instructions for 330 Marina with Tug Boat and partial (pp 3-14) undetermined ship with helicopter pad, Hospital Ship, and Fire Boat. Doubt if there’s a complete set of anything. Anyone interested in purchasing? Does anyone know where I can get copies (PDF, or whatever) for TENTE models – I have a few ships in pieces I would love to rebuild! I have several Tente ships and 2 smaller vehicles, all are new in the original plastic packages, never assembled and in the original boxes, numbered 0710, 0711, 0604 and 0661. Can anybody tell me what I have here, all complete with instructions. You can contact me at gentlesoul911@tampabay.rr.com. No reasonable offer will be refused. Anyone interested in a tente multi model car and truck? this is a 401 part set but I think i counted about 500 . I have a bunch of these blocks sitting away in my closet. I got them from my uncle when i was a kid, they didn’t work with my legos so i just kinda put them in a box away from my legos and forgot about them. I have a pepsi truck, several ships, several of the space domes stuff and i’m looking to get rid of all them. I’m not looking to make money of them and there aren’t any instructions to go with but they’re still cool nonetheless. Email (dlrooze@gmail.com) me some info and I’ll gladly ship out to anyway in the US. For TENTE fans, here is my page TENTE. In the complicated attempt to get all models in all series. I have multiple Tente Bulldozer 307 sets sealed in original packaging. If anyone is interested in buying please contact me. Never seen that site before. Thanks for posting it.